Yesterday, Warner Bros. finally unveiled the new trailer for Justice League, which gives us new looks at all of these superheroes that form this incredible team. The Justice League trailer revealed new footage of Batman (Ben Affleck), Wonder Woman (Gal Gadot), Aquaman (Jason Momoa), The Flash (Ezra Miller) and Cyborg (Ray Fisher), although Superman was still nowhere to be found. Of all these characters, Cyborg is certainly the most obscure in the group, but according to director Zack Snyder, Cyborg's story is essentially the heart of the movie. Here's what the director had to say in a recent interview. "They're each such awesome personalities in the movie. You have Jason stomping around as this inked hairy man, just this mythic figure. And you've got Ezra, who's full of life and hilarious and all over the place and amazing, a really fun and also poignant Flash. And Ray's story is in a lot of the ways the heart of the movie. Ray's story is in a lot of the ways the heart of the movie." The news that Cyborg is at the heart of this story shouldn't be too surprising, since Zack Snyder confirmed in another interview last month that the technology that resides within Cyborg is actually the third Mother Box. 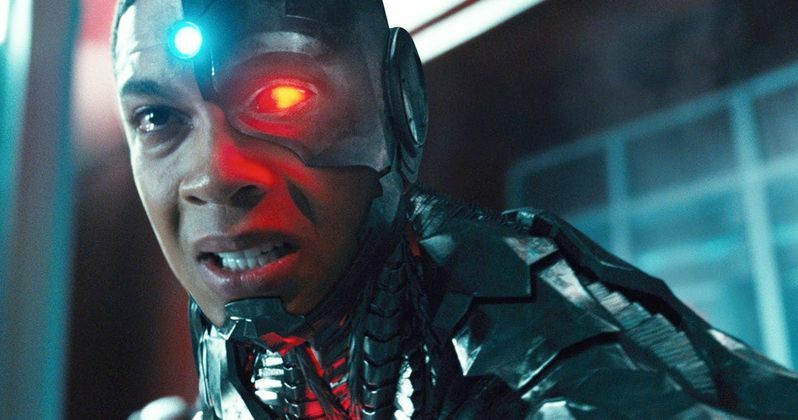 Cyborg's Batman v Superman cameo showed Victor Stone's father Silas (Joe Morton) presents his son with a strange box that turns him into Cyborg, is the "first glimpse of the Mother Box there," according to an that interview with the director, who added that Ray Fisher's character, "plays such a strong part coming up." Here's what the director had to say about bringing all of these characters together in Justice League, in his interview with USA Today. "The thing that's awesome about these icons is that a lot of them we haven't seen in the movies before on the big screen. It's kinda fun to really let (the actors) stretch their legs and inhabit those characters. It is a process to make a team out of this group of individuals, but for the greater good maybe they can put their differences aside." Zack Snyder also confirmed in this interview that Superman will have a presence in this movie, although he wouldn't say much about his return. The superhero sacrificed himself at the end of Batman v Superman: Dawn of Justice, but we saw as the dirt was being piled onto his casket at the end of the movie, that the dirt started to levitate, hinting that the Man of Steel is in fact coming back from the dead. In Superman's absence, Batman will lead the Justice League into battle. Here's what Zack Snyder had to say about Batman dealing with a new team dynamic. ""He's been a loner for certainly his crime-fighting career, maybe with the exception of Robin. When we meet him in BvS, he's definitely at this low point of isolation. That was always our intention, that Justice League would be this continuation for Batman to evolve into a more complete hero." Fueled by his restored faith in humanity and inspired by Superman's selfless act, Bruce Wayne enlists the help of his newfound ally, Diana Prince, to face an even greater enemy. Together, Batman and Wonder Woman work quickly to find and recruit a team of metahumans to stand against this newly awakened threat. But despite the formation of this unprecedented league of heroes, Batman, Wonder Woman, Aquaman, Cyborg and The Flash, it may already be too late to save the planet from an assault of catastrophic proportions. Hopefully we'll have more details on Justice League soon, as we continue the countdown towards the November 17 release.